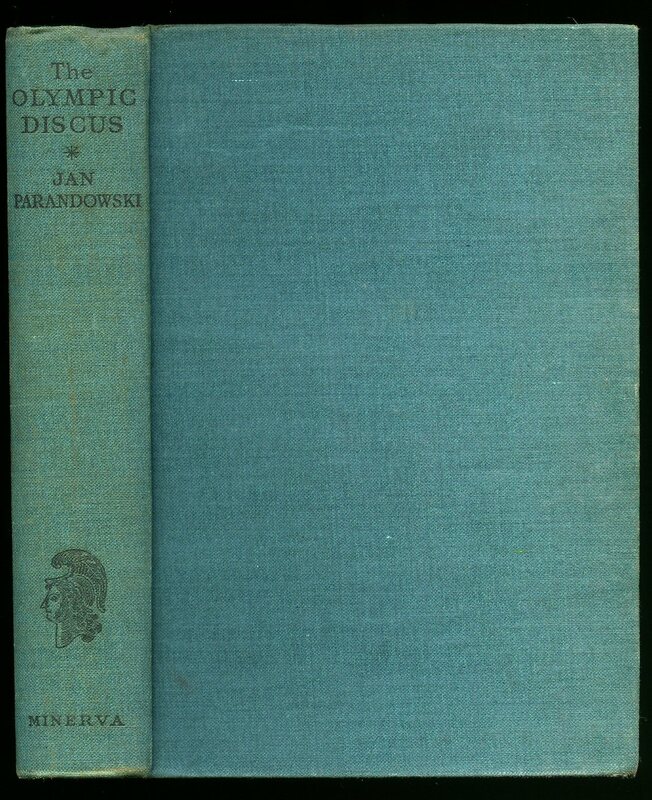 Published by Minerva Publishing Co. Ltd. 36 Russell Street, London First Edition 1939. 1939. First edition hard back publisher's original sea green cloth covers, black stamping. 8vo 7¾" x 5¼" 302 page novel. Upper panel of dust wrapper pasted to front end paper. In Very Good clean and square condition. Member of the P.B.F.A. Published by James Barrie, London First Edition 1956. London 1956. First edition in publisher's original colour card wrap covers. 8vo. 8'' x 5¼''. Contains 224 printed pages of text with monochrome illustrations throughout. Each of the page entries has been meticulously filled-in with the winners name, country, time or length, height, distance in feet and inches. Tanning to the page edges, small repaired tear to the base of the spine and in Very Good condition, no dust wrapper as published. Member of the P.B.F.A. Published by the Author, Singapore First Edition 1998. 1998. 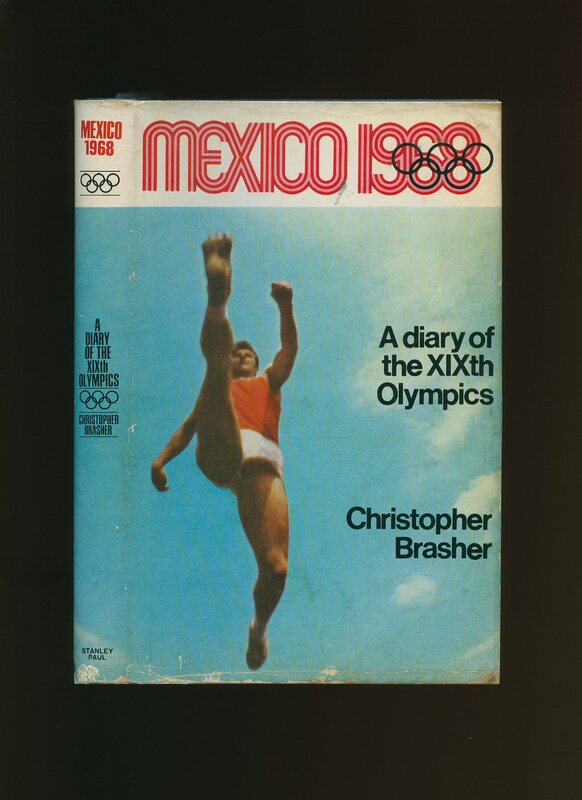 Published by Scott International Marketing 1972. 1972. Publisher's original colour illustrated laminated card covers. Folio 12'' x 8¼'' 96 pp. Colour and monochrome illustrations throughout. Free In Very Good condition, no dust wrapper as published. Member of the P.B.F.A. Hard back binding in publisher's original navy cloth covers, gilt lettering to the upper panel. 8vo 5½'' x 4¼''. Colour illustrations throughout. Three metal coins in place. Free from inscription and in Fine condition, no dust wrapper as published. Member of the P.B.F.A. 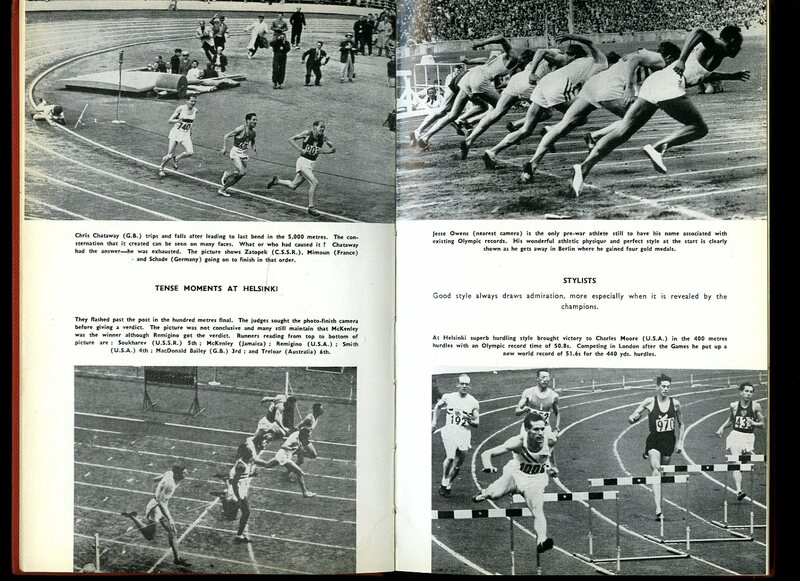 Published by Modern Athlete Publications Ltd., Croydon 1956. London 1956. Hard back binding in publisher's original brick red cloth covers, black lettering to the upper panel. 8vo 9'' x 6'' 96 pp. Monochrome illustrations throughout. Melbourne 1956 Olympiad Souvenir Programme to the rear, this has not been filled-in. In Very Good condition, no dust wrapper. Member of the P.B.F.A. 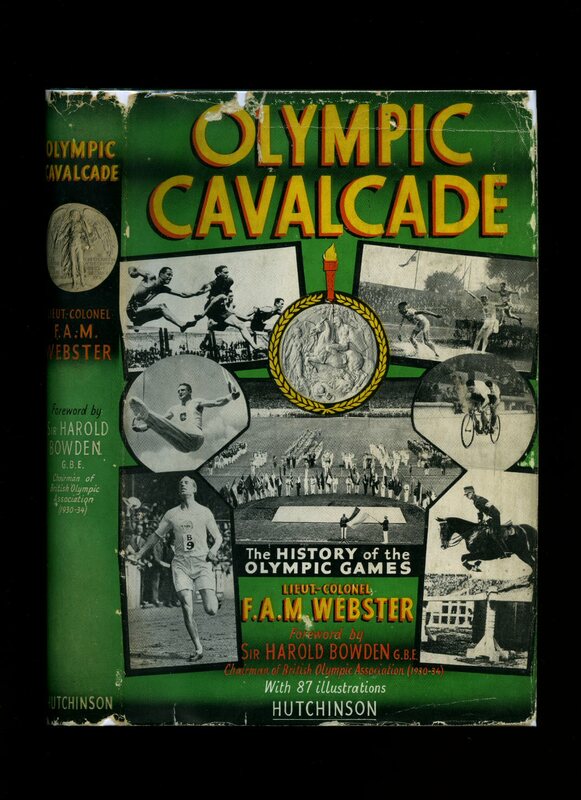 First edition in publisher's original colour card wrap covers. 8vo. 8'' x 5¼''. Contains 224 printed pages of text with monochrome illustrations throughout. Each of the page entries has been meticulously filled-in with the winners name, country, time or length, height, distance in feet and inches or metres. Tanning to the page edges, small repaired tear to the base of the spine and in Very Good condition, no dust wrapper as published. Member of the P.B.F.A. 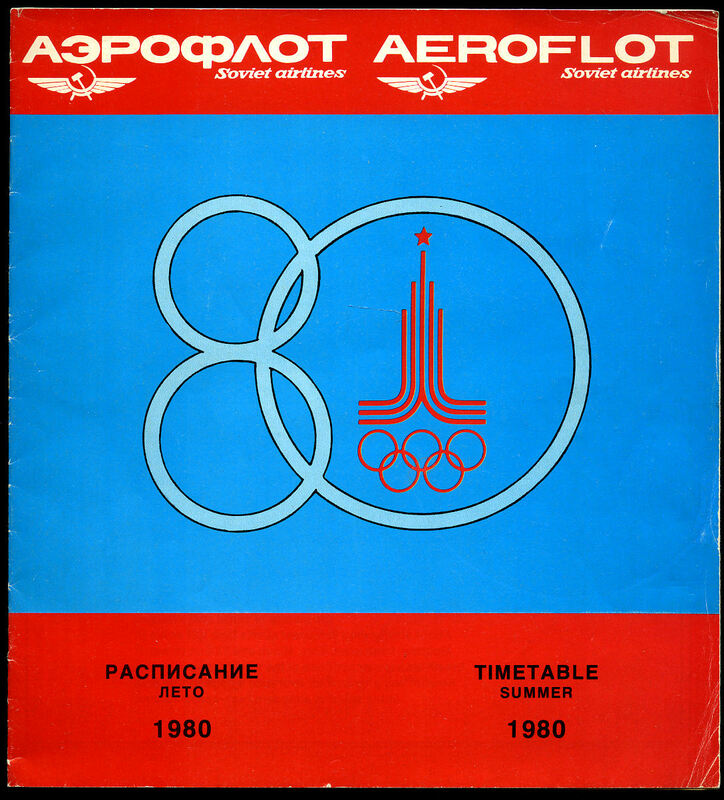 Aeroflot Soviet Airlines Summer Timetable 1980 | Airline Scheduled Services Timetable (Olympics Timetable) Games of the XXII Olmpiad. Original colour illustrated stapled paper wrap covers [soft back] booklet. 8½'' x 8''. 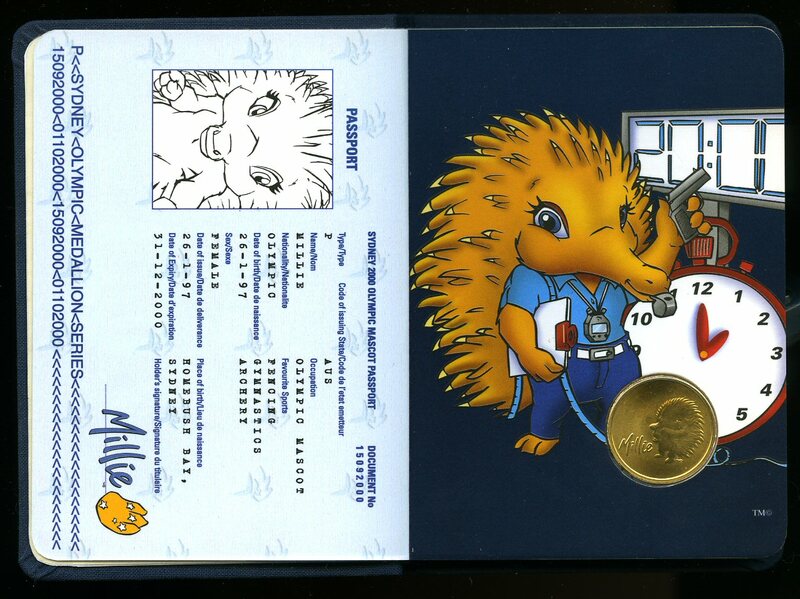 Contains 24 pages (including the covers), with full-page colour illustrations. In Very Good condition. Member of the P.B.F.A. Published by The British Broadcasting Corporation at 35 Marylebone High Street, London November 1956. 1956. Original stapled newspaper type paper 12'' x 10'' with monochrome photograph to the front page and throughout. 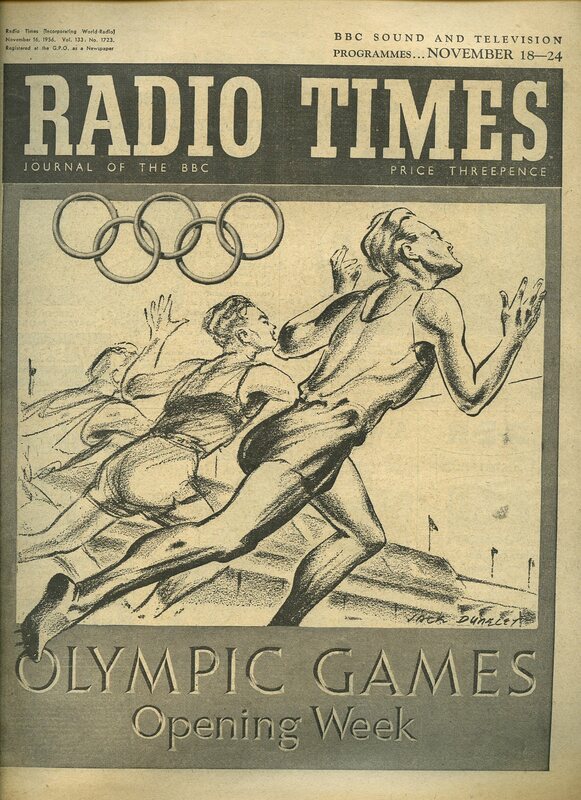 Contains printed pages of text showing radio programmes for the Home Service, The Light Programme, and Third Programme followed by television programmes for the week. 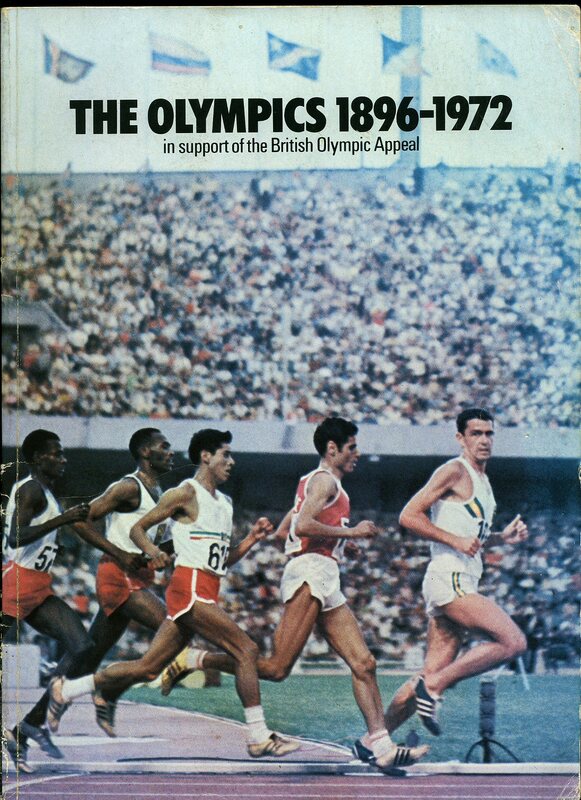 Two page article on the Melbourne Olympic Games and how the BBC propose to cover the broadcasts from Melbourne. Cheap paper a little browned to the edges. We currently hold in stock 20 other early Radio Times titles. Member of the P.B.F.A. Published by Stanley Paul & Co. Ltd., 178-202 Great Portland Street, London First Edition 1968. London 1968. 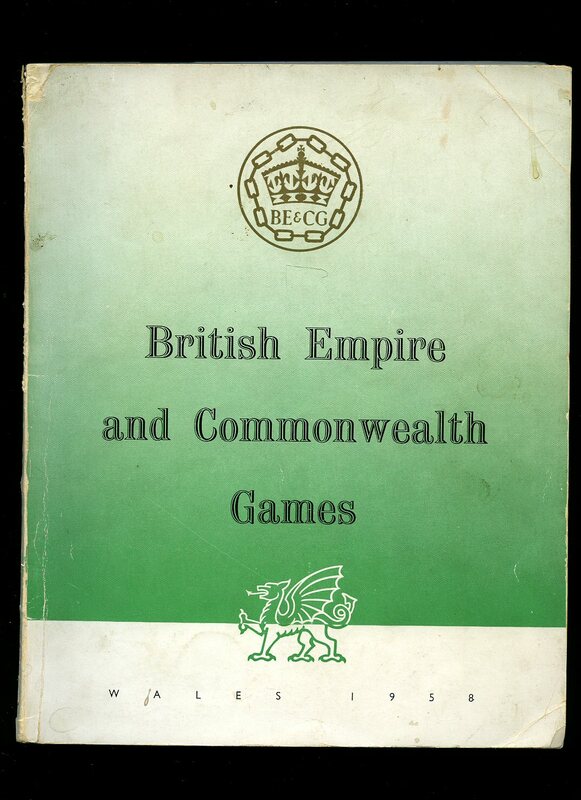 Published by British Empire and Commonwealth Games (Wales) Ltd., First Edition 1958. 1958. First edition in publisher's original illustrated card wrap covers, [softback]. Quarto 10'' x 8''. 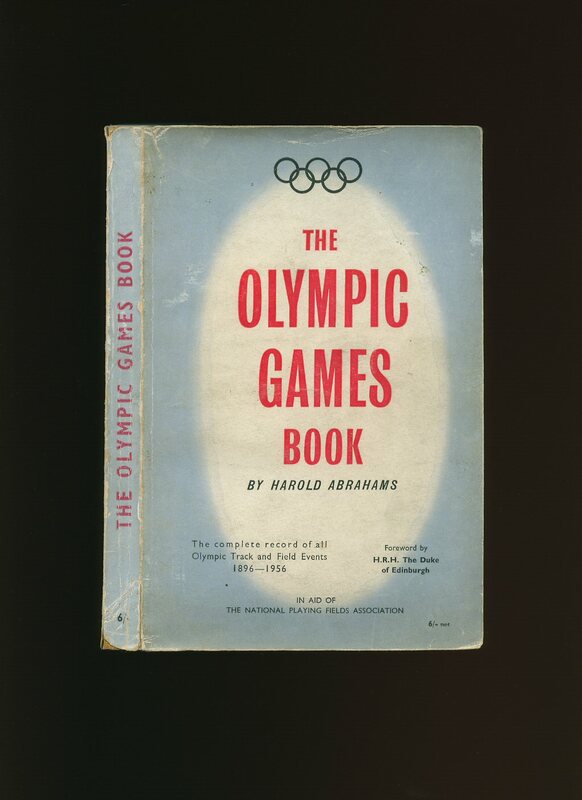 Contains 96 pages printed pages of text followed by 96 pages of sponsors' advertisements with monochrome illustrations and photographs throughout. Small chips and rubs to the spine ends and upper rear edges, creases across the corners of the front cover and in Good condition, no dust wrapper as issued. Member of the P.B.F.A. 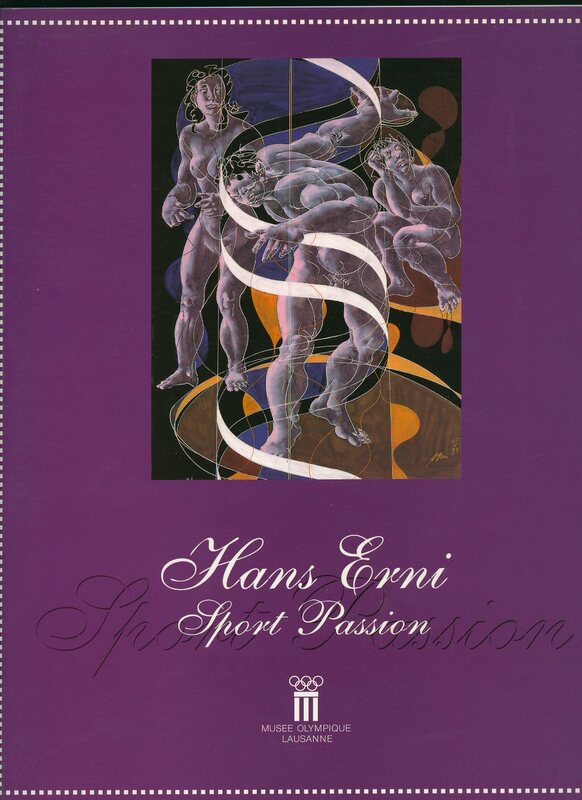 Published by Musée Olympique 1, Quai d'Ouchy, Lausanne 1999. 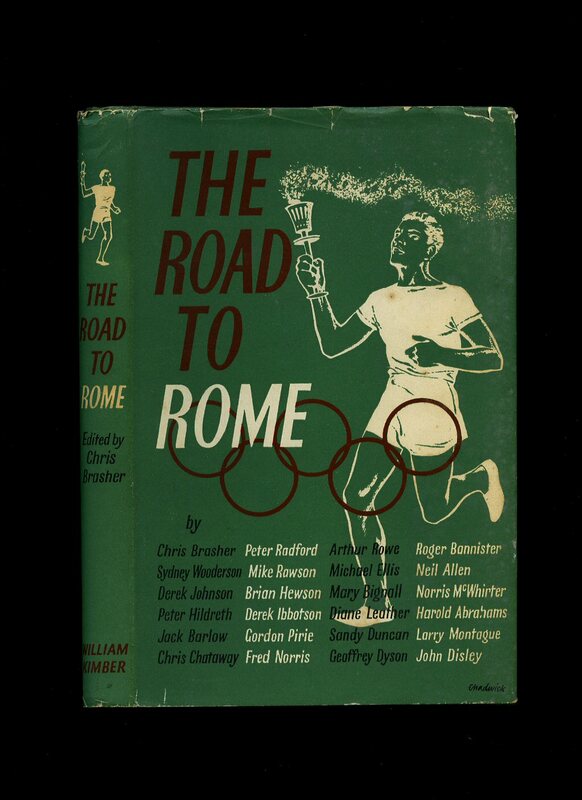 Published by William Kimber & Co. Ltd., Godolphin House, 22a Queen Anne's Gate, London First Edition 1960. London 1960. First edition hard back binding in publisher's original forest green paper covered boards, gilt title and author lettering to the spine. 8vo. 8½'' x 6''. 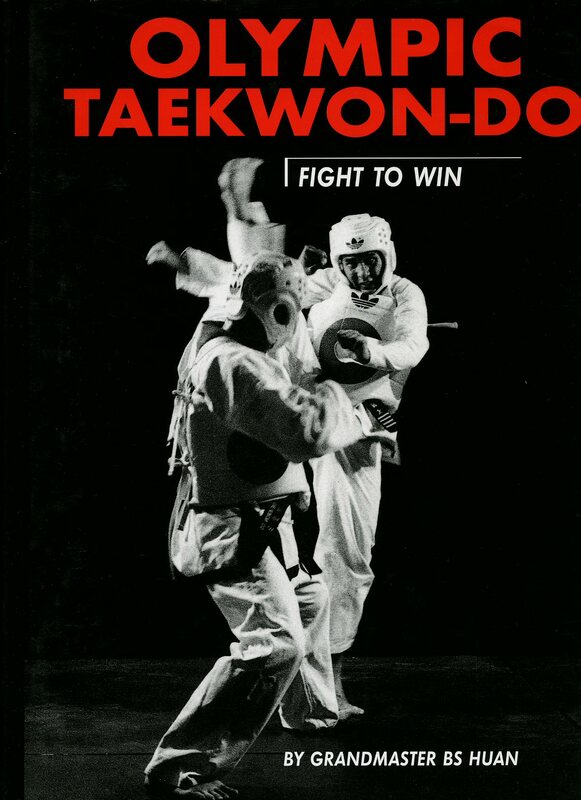 Contains 160 printed pages of text with monochrome photographs throughout. Spine ends scuffed, school prize plate to the front free end paper, tan age spots to the fore and upper edges. Near Very Good condition book in near Very Good condition dust wrapper with shallow nicks and chips to the upper edges, not price clipped 15s. Dust wrapper supplied in archive acetate film protection, it does not adhere to the book or to the dust wrapper. Member of the P.B.F.A. Published by Hutchinson & Co. Ltd., 17-21 Conway Street, London circa 1948. London circa 1948. Hard back binding in publisher's original racing green cloth covers, gilt title and author lettering to the spine. 8vo. 9½'' x 6¼''. Contains 243 printed pages of text with monochrome illustrations and photographs throughout. A little wear to the spine ends, name and address stamp to the two paste downs and title page, foxing to the closed fore edges. Very Good condition book in near Very Good condition dust wrapper with nicks, chips and rubs to the spine ends, corners and edges, not price clipped 21/-. Dust wrapper supplied in archive acetate film protection, it does not adhere to the book or to the dust wrapper. Member of the P.B.F.A.